Robust twin rail sawmill with powered saw head controls, gas power, 36 inch log diameter, 35-1/2 inch width of cut, 18 foot 5 inch log length, and optional SimpleSet Setworks & Debarker. 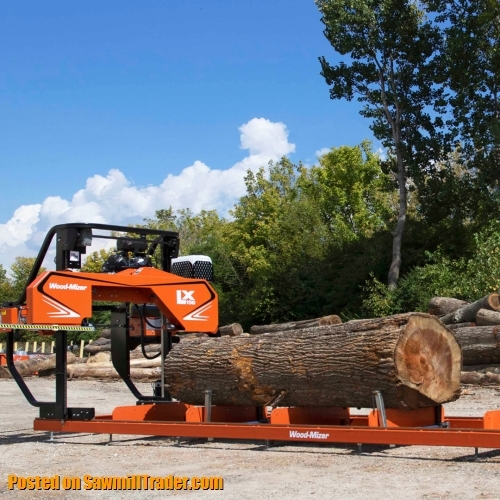 Saw 36” diameter logs into wide slabs and boards up to 35-1/2' using accurate and easy-to-use powered saw head controls (forward/reverse & up/down) with the LX150 twin rail portable sawmill! Designed for hobbyists and professional sawyers, the highly durable bed configuration, optional SimpleSet Setworks, and optional Debarker make the LX150 a high performing manual sawmill with features not available anywhere else in its class. Loaded and turned manually with a cant hook, logs are secured on the elevated bed cross sections by three adjustable side supports and two adjustable log clamps. With powered up/down, the saw head height is precisely positioned for each cut. Once the powered blade guide arm is adjusted for the cut, the blade is engaged and saws through the log by the powered saw head forward/reverse controls. Optional SimpleSet setworks allows two pre-set board thicknesses to quickly and accurately control blade height while referencing from the previous cut. Turned on and off with a manual valve, the gravity fed lubrication is applied directly to the blade to keep them clean and free of pitch and sawdust build-up. An optional debarker removes dirt and bark from the blade path to keep blades sharp longer. Once the cut is completed, the saw head is raised and reversed by the powered saw head controls and lowered for the next cut. 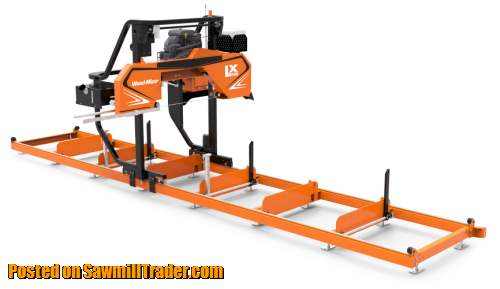 The LX150 twin rail sawmill ships on a single pallet, comes with one Wood-Mizer sawmill blade, and requires minimal assembly time. 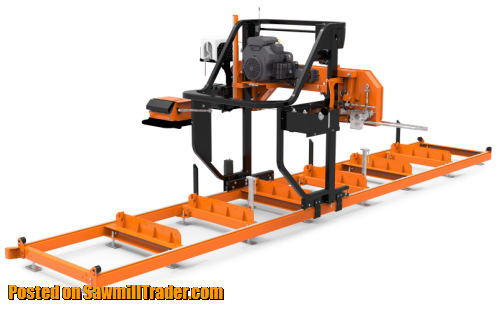 With a 30-day money back guarantee, and 2-year sawmill warranty, the LX150 sawmill is backed by the same legendary service, quality, and safety features shared by the entire family of Wood-Mizer wood processing equipment.